Subterranean is the most common type of termite. 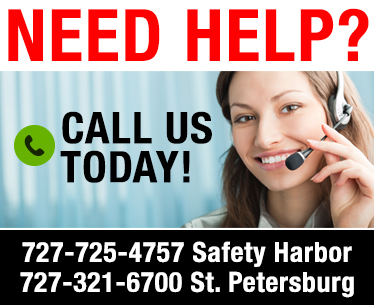 They work 24 hours a day and are usually found while doing remodeling or repairs. Large swarms of winged insects around the home are the most obvious signs. Swarming occurs when reproductive male and female termites exit the colony and attempt to build a new colony. Termites swarm at various times according to geographic regions, species type and weather conditions, but mostly in early spring . Most common times for swarming are midday, often on sunny days and/or after rain. Formosan termites are an exception, they swarm in the evening. 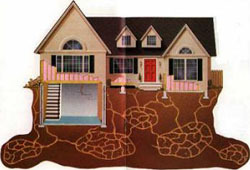 There are two methods for treating subterranean termites. The first method is the earth-friendly Sentricon® Termite Colony Elimination System. This system provides proven long term protection from subterranean termites by eliminating the termite colony. Stations containing wood monitoring devices are installed in the ground around the structure. Once the termites begin to feed on the wood, they are collected and transferred into tubes with a toxic bait. The tubes are then placed back into the ground. Termites tunnel out and recruit other termites in the colony to feed on the bait. As the bait goes to work the termites begin to die off. Eventually the colony is eliminated. The second method is a chemical injection treatment with Termidor®. Once the termites have been located and the extent of their activity is determined, the application program will begin. Termidor® is a liquid, applied with water, and the most effective way of spreading it is through small trenches, dug along the foundation line of your home. The entire Termidor® application program is typically completed within hours. Within about 3 months, your entire treated area will be 100% termite free.